This page is from a previous year. Germanfest is a little like Oktoberfest in Germany. The first Oktoberfest was held in Munich in 1810, when King Ludwig I married Princess Therese of Saxony-Hildburghausen. 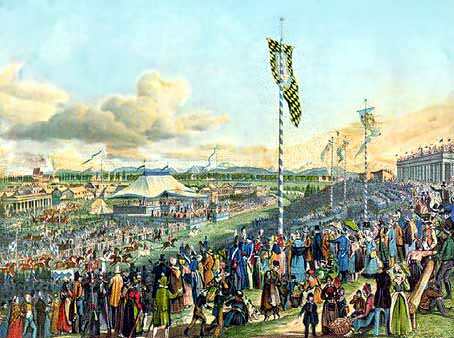 The event was held in the fields by the city gate, hence called Theresienwiese ("Theresa's fields"). According to the Munich Tourist Office, Oktoberfest is now the largest festival in the world. Add all ingredients to a pan with the hot bacon drippings. Cover and simmer a half-hour, stirring occassionally. Garnish with broken-up bacon and some apple slices. Serves four. Peel, core and slice apples. Mix sugar into beaten eggs until creamy. Add lemon rind. Stir in flour and baking powder. Cover the bottom of the pan with about 1/4 of the dough. Add apples. Put rest of the dough over the top. Bake at 350 F for 45-50 minutes in a 9" cake pan. Mix all ingredients except sauerkraut. Let stand 30 minutes. Drain sauerkraut then add it to other ingredients. Let stand 10 - 20 minutes before serving. In a saucepan, melt the butter and add apples and cabbage. Stir until the apples just start to soften. Add vinegar, sugar, mustard, salt, and pepper. Simmer 2 minutes, stir in the sour cream and serve.